Michael Dell is taking the computer and IT company that bears his name private. He’s talked about it before, but all the indications are that, this time, he is serious. 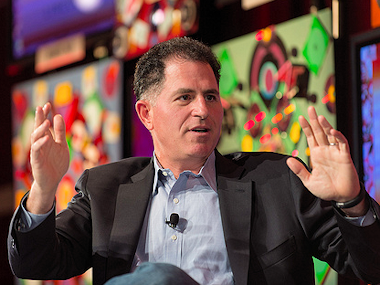 Using a combination of shares he already owns and personal cash, Dell will, according to most reports on the deal, nudge his ownership stake north of 50 percent. Silver Lake Management and Microsoft are also said to providing some of the financing, though the role of the software giant is, as The Wall Street Journal reported, still under discussion. Reuters reports that the deal could be announced as early as Monday. Dell has been trying mightily to transform itself from the PC maker that no one could compete with in the 1990s to an IT hardware, software and services company. Shareholders have not been forgiving, and, in their defense, as analyst Shaw Wu recently observed in a research note to clients, Dell has spent about $13 billion on enterprise-related acquisitions since 2008, a recent highlight being the $2.4 billion deal for Quest Software; still, about 70 percent of its revenue remains tied to PCs sold both to consumers and to businesses plus ancillary products that are closely tied to PCs (printers, monitors and so on). That’s down from a much higher percentage early last decade, but turning the corner has been slow, and progress has come in fits and starts. Meanwhile, the PC market has been in a state of decline, leaving Dell in a rush to replace slowing revenue growth in that space with other things. While the idea to transform Dell into an enterprise-focused company has merit, the PC business has been contracting so quickly that the changes aren’t having the desired effect on the shares. Now it looks like he’s going to do it without the bother of having to report to shareholders.